This pattern is unfortunately only available in the two out-of-print publications listed above. However, a Google search for the pattern seems to be helpful. 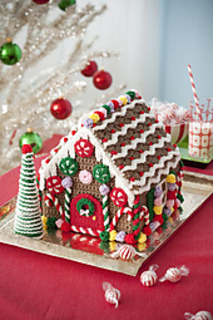 Also, you might enjoy taking a look at my other gingerbread house patterns here on Ravelry as well as on my blog, pinkmambo.com. Why toil in the kitchen when you can crochet a sweet old-fashioned treat? Crocheted candies and “frosting” decorate this delightfully kitschy holiday house—best of all, it will last for years to come.